Home Archive New 24-Hour Record Set! The pedal vs. paddle debate has been settled…for now. A 5.79-km circular course was surveyed and marked with buoys. At 9:30 a.m. on September 8, Kolodziejzyk started pedaling Critical Power 2, his custom pedal-powered boat, and made continual loops around the course. He stopped only once for two minutes to put on warm clothes for the night, and received food and water from his support crew by a special telescopic rod (i.e. golf ball retriever) so that he wouldn’t have to stop pedaling. Exactly 24 hours later, as per the atomic clock used to time the event, Kolodziejzyk had finished 42 complete laps plus a partial lap equaling 151.3 miles (245.16 km) total distance traveled. 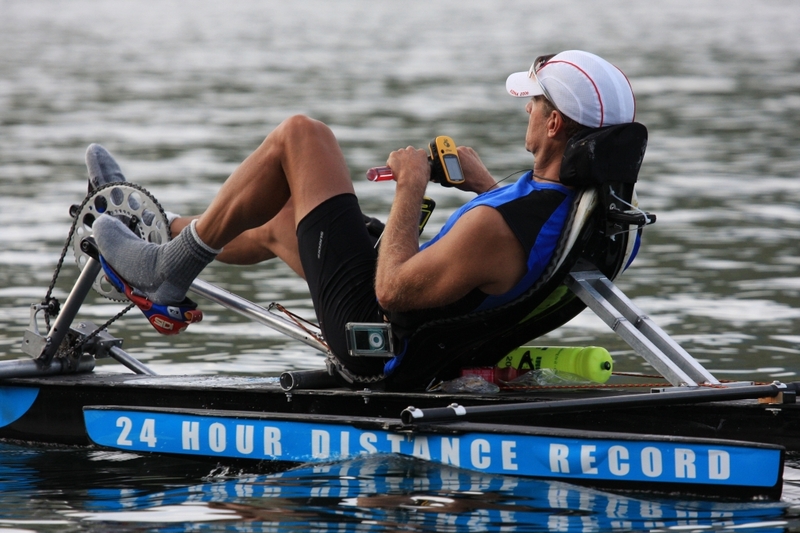 This feat beat the old record of 241.8 km set by kayaker Carter Johnson in 2006 in California. Official observers from the International Human Powered Vehicle Association (IHPVA) were stationed at key points along the course to verify that Kolodziejzyk stayed to the outside of the markers, and traveled the full distance measured. “This was an especially tough record attempt because we never did get the new boat up to the speed and efficiency needed to break Carter’s 24-hour kayak distance record,” he says. “Since I use a power measuring device on my cranks, I knew exactly how many watts I was capable of producing over 24 hours, and combined with the speed of the new pedal powered boat Critical Power 2, it predicted that I’d be about 10 to 20 km short. Kolodziejzyk is already the fastest man on earth, with a world record set in 2006 for the most distance covered by human power in 24 hours on land. He powered his custom carbon fiber bullet bike “Critical Power” 1046 km in just one day on a race track in Eureka, Calif., on July 19, breaking the existing world record by 26 km. He also holds a Guinness world record for the most distance traveled in 24 hours by pedal-powered boat which he accomplished in June 2007 in Calgary. Greg is an endurance athlete who has finished dozens of marathons, 12 Ironman triathlons and qualified for Ironman World Championships in Kona, Hawaii. “My pace was above the record during the day, and slowly dwindled during the evening to a point that was almost on the minimum record pace by morning,” he says. “That was tough – I knew that I had only a few hours left to go and that the only way I was going to break Carter’s 242-km mark was to hang on to that pace — even if it was killing me. And I did. — Kolodziejzyk speaks at schools throughout Calgary about achieving goals and leading a happy and productive life. His program, “KidPower,” teaches kids that they can achieve their dreams with focused effort, hard work and discipline.